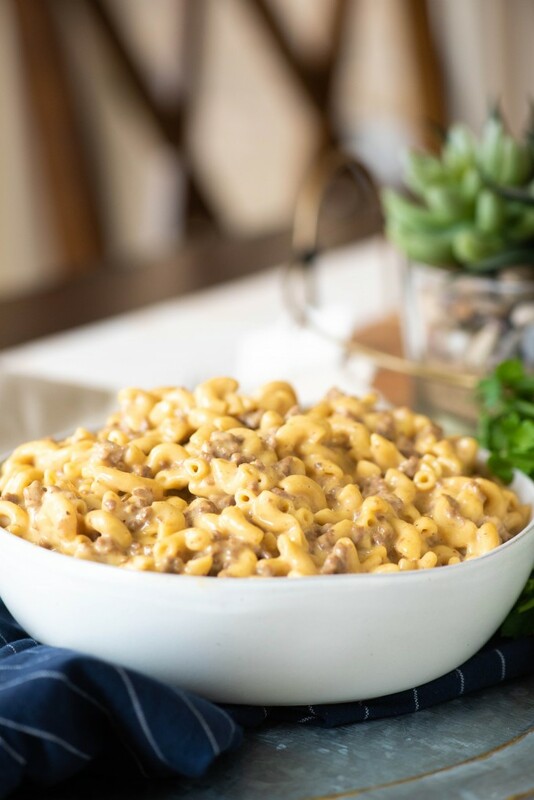 This Instant Pot Cheeseburger Mac is the best easy recipe for busy weeknights. Hamburger Helper doesn't compare to this homemade cheeseburger mac! Heat the inner pot using the SAUTE function. When display reads HOT, add the ground beef to the pot along with 2 tsp of the salt, pepper, mustard, garlic powder and onion powder. Use a wooden spoon to break up into fine pieces. Add the macaroni to the pot and then pour over the beef stock. Make sure as much of the noodles are covered as possible, but do not stir. Cover the pressure cooker and lock lid in place. Ensure sealing valve is set to SEAL, and set the pot for HIGH pressure for 5 minutes. When timer beeps, quick release the pressure. Pour in the milk and add the cheeses to the pot. Stir pasta together gently until cheeses are melted and creamy. Taste test and season with up to 2 tsp of remaining coarse kosher salt (or needed amount of regular salt). Sauce will thicken as it stands.